Rob Nichols' coach at Washington State University Bobo Brayton once kidded Nichols about his intensity. By his senior year in 1990, Nichols had improved on that, according to The Seattle Times. "I've calmed down a lot, the last year or two," Nichols told The Times. "But Bobo told me he'd rather calm a guy down than get a guy fired up." Nichols didn't have to get fired up later that year as he turned pro. But whatever intensity he played at, Nichols played only a single season. Nichols' pro career started and ended that year in 1990, taken by the Mariners in the 54th round of the draft out of Washington State. With Washington State, Nichols made first-team all-conference in 1989 and 1990. He recalled his old coach Brayton fondly years later. "We learned a lot more on the field than just baseball," Nichols told Washington State Magazine of Brayton in 2007. 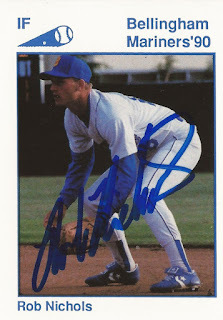 Nichols played his one pro season at short-season Bellingham. He got into 57 games, playing mostly at first base. He also saw time at third. He hit .225, with three home runs and 23 RBI, representing the extent of his career.